What do you do? It can be tough handling the full day to day workload of a Merch by Amazon Business from product research, keyword research, designing, writing product listings, and uploading your Merch shirts it can become a tedious process that requires a lot of time and energy. Finding and hiring a good designer will free up time, and allow you to focus on the more important aspects of your Merch business. Unless you’re a designer by trade you could really use the expertise of a good designer. Having a good designer will handle one of the primary aspects of your Merch business and allow you to scale to whatever extend you like. Once you learn the process of finding and hiring a designer you can repeat it as often as needed. When you find a hiring strategy that works, you can outsource almost all aspects of your Merch business saving you even more time and allowing you to focus on growing your business to higher levels. You can find designers that are looking for work on various different websites, groups, and online communities. To keep this simple I recommend you use freelance websites such as Freelancer, Upwork, Fiverr, and/or 99Designs to find a pool of designers. I’ve used Freelancer to hire designer’s multiple times. It’s a good platform, and you quickly have people bid on your jobs, and you can view their portfolios and chat with them to get a feel for their work. Once you find the right fit, you can setup a milestone, fund it, and then wait for your work to be complete and approved by you. I’ve found designers on freelancer for as cheap as $5-$10 per design, but you have to filter through quite a few people to find the good ones. Again, I always recommend you test each designer by giving them multiple small design jobs to see if they come through and meet your expectations. Upwork.com is another good alternative to Freelancer, and it offers similar talent and pricing as Freelancer. Fiverr.com is a quick way to pick a “gig” and hire a designer for $5 a pop. If you like their style, and they do a good job you could negotiate a per design basis at $5. Whenever you need an idea designed, you could email the details to the designer, and have them email over the finished design when complete. 99Design is the most expensive option on this list. You can setup a competition that attracts professional designers. I don’t recommend you go this route unless you’re looking for very detailed and intricate designs. Simple t-shirt designs have been proven to sell well on Merch by Amazon, but if you find a winning niche, and you spot an opportunity worth creating a fantastic design around, this is one way to do it. You can hire a graphic designer by setting up a job listing on one of the freelance websites mentioned above. I’ll guide you through this process using one of my favorite freelance platforms: Freelancer.com (these are my affiliate links). Go over to Freelancer.com and click on the orange “I want to hire” button. After clicking the “I want to hire” button, you’ll be redirected to the project page. This is where you fill out the details for your graphic design project. I’ll assume you already have an idea in mind. If you do not, you can quickly find winning design ideas using our free Merch by Amazon Product Research Tool. 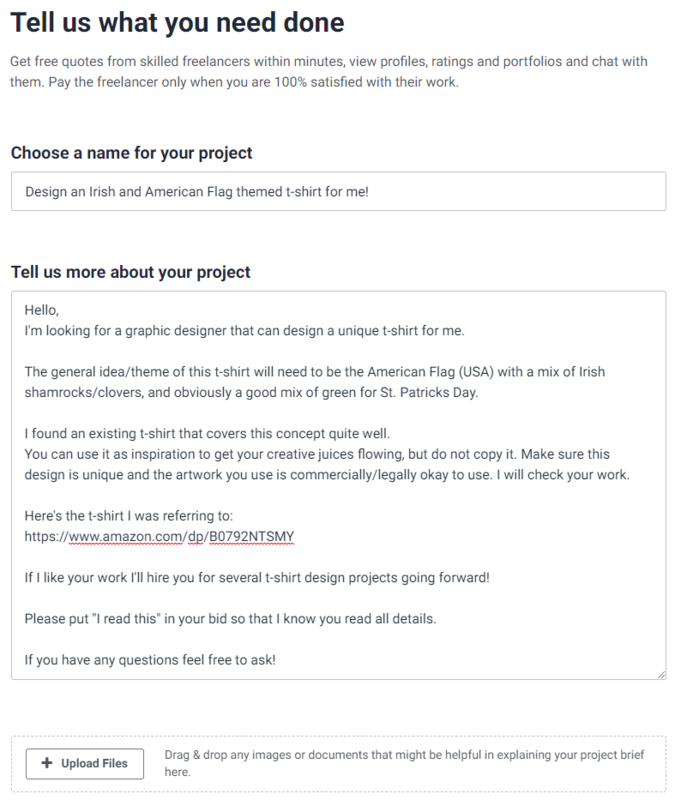 For this example, I’ll go through the steps to get an Irish and American Flag themed t-shirt created. Moving on… Make sure you select the right tags. For a t-shirt design, the below tags should be more than enough to attract the right prospects. Now, you’ll be given the option to set this project up as a competition. I don’t recommend you go this route as you’re looking to find a good designer that you can work with long-term. You’ll want to set this project up as a “Standard Project” (free), with a “Fixed price”, and with a “Micro Project” budget. Refer to the image below for more details. Once your project details are filled out you can click on the orange “Post my Project” button. You’ll almost instantly start to receive bids, and you can chat with each prospect, check their portfolios, and ultimately get an idea of their style, and quality of work. If you feel like one of the designers are a good fit you can “award” them the project, and fund the “Milestone.” Freelancer will hold the money as a middleman until the project is complete, and then you can “release” the funds when you receive the design files and are satisfied. Make sure you test your designers by giving them a couple different jobs to do. Once complete, check their work to make sure it’s good, and that it’s okay to use commercially. If you like their style, negotiate a deal, and bring them on long-term. Rinse and repeat this process of hiring/testing as many times as you need until you find someone you truly like that does a good job. I’ve found good designers that charge me $5-$10 per design on Freelancer, and I’ve been working with some of them consistently for over 7 months. 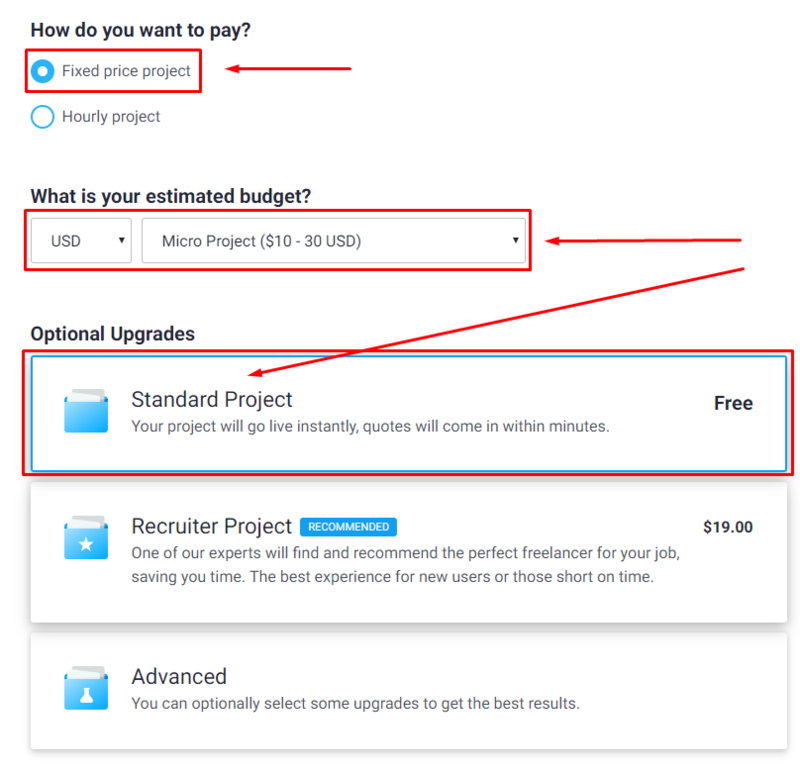 Each of the freelance platforms mentioned above have different pricing ranges. You can quickly find $5-dollar designers on Fiverr. With Freelancer and Upwork you can find good designers for $5-$25 a pop, and you can use 99Designs to setup a competition for a really intricate design anywhere from $99 – $300+. I recommend you start looking for good designers that will work for $5 per t-shirt design. They exist, and they are out there. Paying five dollars per design to someone in the United States might not be worth it, but five dollars per design to someone in the Philippines can go a long way. Talent exists everywhere, you just need to find It, and ultimately you get to decide who you hire and what you’re willing to pay per design. You should now have a plenty of options and a good understanding of where you can find and hire freelance graphic designers to handle your Merch by Amazon or Print on Demand design work. It’s good to remember that it can take time, filtering, and persistence to find the right designer, but once you do it is very well worth the initial time and energy invested. Having a good talented designer will allow you to scale your business and focus on the more important aspects of your Merch by Amazon endeavors! Add a new comment in How to Find and Hire a Graphic Designer for Merch by Amazon article.